On March 20th, Dave Bonewicz, Systems Integration Specialist with Axia Women’s Health, and Mark LaRow, CEO of Verato, participated in a webinar in which they shared how Axia solved its patient matching challenges by deploying the Verato Universal™ MPI. Verato’s Referential Matching technology was able to assist Axia in dramatically reducing its duplicate medical records which was critical to facilitate M&A activity. Now, Axia is in a position to continue growing and achieving broader visions without the challenges of rampant record duplication. Read on to learn more about Axia, it’s challenges, and how Verato was able to help. Who is Axia Women’s Health? Axia Women’s Health formed in early 2017 as a merger between two practices in Pennsylvania and New Jersey. This merger brought together more than 275 providers and 100 women’s health centers, making Axia the largest integrated provider of women’s health care in the U.S. Growing Pains – with more patients comes more duplicate patient records. With this rapid growth, the ability to match disparate data across Axia care centers became a huge priority. They wanted to continue improving patient care as they expanded, and this relied on having accurate patient records. As they combined the New Jersey and Pennsylvania groups, they anticipated a significant need for clean-up of their existing 25 patient databases, as well as deduplication across the combined databases, in order to have the most complete and accurate patient records at all of their providers’ fingertips. Old master patient index (MPI) solutions were no longer cutting it. Before the merger, they had been utilizing probabilistic matching, which was struggling. Probabilistic matching depends on weights and rules to calculate the probability that two records belong to the same person, and struggles to match out-of-date, incomplete, incorrect, or different data, like a name or address change. It also struggles to scale to larger patient populations and merge datasets during M&A. At first, their solution was to simply throw more people at the problem and their help desk quickly became inundated with merge requests from care centers who were reporting fragmented medical records. This large uptick in help desk merge requests forced them to seek a better solution. They needed to deduplicate their existing databases, eliminate duplicates when migrating to new databases in the future, and eliminate duplication created from manual errors. They desired an accurate, scalable solution that was easy to implement and could operate in real-time. Most importantly, they needed a cost-effective solution fast. Verato recognizes that patient-centered organizations fundamentally depend on complete, accurate, and connected patient data, but in reality, that data is often disconnected, duplicated, and siloed. This means that as the volume of patient data inevitably increases, whether from M&A or as new initiatives such as population health and telehealth come to fruition, accurate patient matching becomes 10x more difficult and 20x more critical to solve. The Verato Universal MPI allows providers to rapidly spin up a powerful, hyper-accurate, world-class MPI to automatically find overlapping patients and duplicate records even with massive data volumes and hundreds or thousands of data sources. In addition, it is able to automatically resolve a significant majority of the “potential duplicate” records that other solutions ­­– like EHRs or other EMPIs – flag for manual review. Verato utilizes Referential Matching, the new gold standard in patient matching technology. The demographic data from patient records is matched to Verato’s comprehensive, continuously-updated, and highly-curated reference database of identities, which spans the entire U.S. population and contains up to a 30-year history of demographic data for each identity. This database is essentially a pre-built answer key for all patient demographic data, enabling Verato to make matches that probabilistic matching fails to make, such as name and address changes. As a cloud-based solution, there are no costs for hardware, tuning, maintenance or upgrades, so total cost of ownership is significantly lower than conventional MPIs. Integration is vendor agnostic and implementation is simple and easy with modern APIs. In fact, Axia was able to implement the Verato Universal MPI in six weeks. Many people at Axia had initial doubts about how successful the project would be due to negative experiences with merging databases in the past. But this time was different. The first step was ensuring that implementing Verato was technically possible – and questions needed to be answered, such as how to integrate and with what tools? Axia found that simple integration with their original eClinicalWorks EMR system through HL7 messages made for a seamless process. Next, working with Verato, they were able to implement a logging and auditing system in order to detect when duplicate records are created, through overlay detection, in order to undo, or simply understand, merges created by human error. The next step was an initial clean-up. Verato processed Axia’s data and found that 10% of their patient records were duplicates. 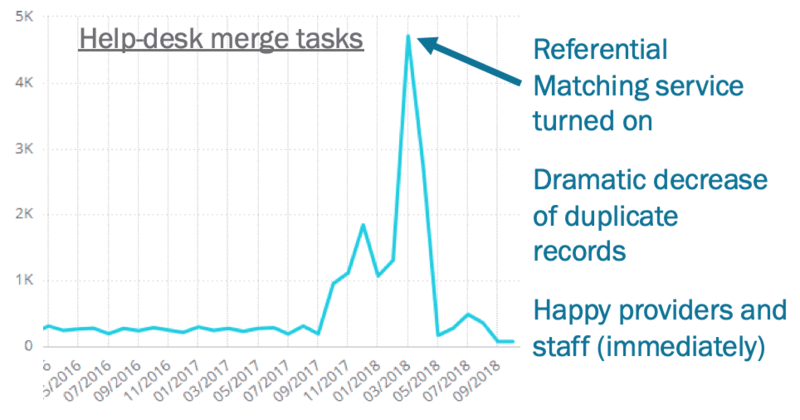 This cleanup deduplicated 125,000 extra accounts and led to an immediate dramatic decrease of duplicated merge requests. Their providers and staff saw immediate ROI and their help desk wasn’t burdened with nearly as many deduplication requests. (3) Assist in setting up workflows to ensure future success. Finally, they implemented an organic workflow to ensure accurate matching in the future, even as more data sources are added. This allows for real-time monitoring to prevent duplicates from occurring going forward. Move forward with improved integration and analytics. As a multi-specialty provider, the ability to integrate with other labs, hospitals, and third-party systems is extremely important to Axia. Before, it was possible that patients could have separate records at each point of care – such as fertility centers, imaging labs, or OBGYN offices. Now, all of these records are synchronized, and they are in a position to expand and integrate seamlessly with additional care centers as well. Improved analytics is another benefit that Axia gained after implementing Verato. Previously, it had been difficult to report on the patient lifecycle across all of their different specialty providers. They could not answer with confidence questions such as how a patient was referred, when a patient entered an expanded care center, or how long they stayed. Now, they are now able to report accurately and confidently. As Axia continues to grow, the Verato Universal MPI will continue to help them achieve their larger vision of being a continuum of women’s healthcare, leveraging their multi-specialties to provide a positive patient experience across the board as a one-stop shop for their patient-base.